If you have family cell service through Sprint, your phone can also afford you a little peace of mind when it comes to your kids. As part of the services included with your Sprint phone and service, there’s a suite of Family Safety Essentials, which we took for a spin over the holidays in NYC and on a recent trip to Las Vegas. If you have kids that walk to/from school, or maybe they’re going over to a friend’s house after soccer practice, the Sprint Family Locator gives you some additional peace of mind that your kids are where they’re supposed to be during certain times of the day. There’s safety checks built in that allow you to be automatically notified of your child’s presence specific days and times that you set up. We tested this feature out specifically while spending Thanksgiving weekend at the Macy’s Thanksgiving Day Parade, and while shopping and holiday sight-seeing around NYC, and also while our son was with his nanny in Las Vegas while we were working. While we were at the convention floor at CES, we could check and set up alerts for if they left the hotel, or if we just wanted to know where they were within the resort complex. Sprint Family Locator is free to try out for 15 days, and then costs $5/month to track up to four phones. If you have a teenager that’s driving, Sprint, like many other carriers these days are focused on reducing the amount of distracted driving that takes place on the roads today (71% of adults have admitted to texting while driving according to Sprint). 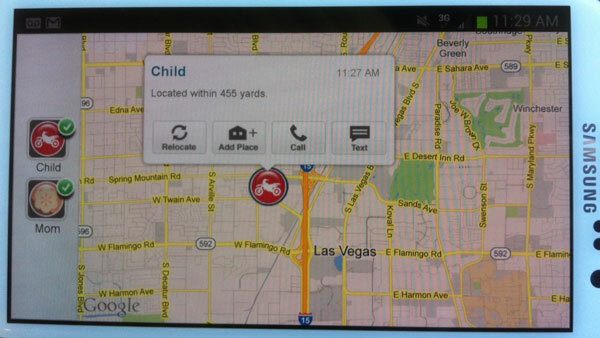 The Sprint Drive First program is designed to lock your phone while the vehicle is in motion to deter you from texting. 83% of teens text late at night according to Sprint, so Sprint Mobile Controls give you as the parent the ability to monitor and control usage of your teen’s phone during certain times of the day, like school and late hours. If you have an Android phone, you can sign up for a free 15 day trial, and then the service costs $4.99/month.